East End Food Co-op rules Pittsburgh! East End Food Co-op has joined the Life by Chocolate Family. They now carry our chocolates. East End Food Co-op is the first Pennsylvania store to sign up and order our amazing chocolates. Sorry, but I don't think Kim took pictures. She was coming home from her quilting workshop. Not to worry. We'll go get pictures. Please go and buy your chocolates at East End, especially Life by Chocolate. They support the local farms and artisans, such as Life by Chocolate, and so should you. And go eat at their lovely award winning Vegetarian Cafe. I know Kim can't wait to go back and get a meal there. I can't wait. Pittsburgh is a great city and this is a great Co-op. They even have a credit union. There are many ways to decorate your chocolate. You can pipe colored chocolate onto a finished product. That's how I decorate my truffles. You can use nuts or flowers or some topping. I do that for my lavender ganache and my caramels. I also use gold and silver flakes. 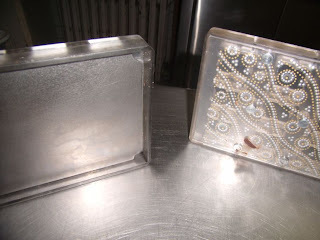 You can color your mold using cocoa butter or you can use magnetic molds and transfer sheets. Transfer sheets are acetate sheets that are decorated with cocoa butter. You may either do this yourself, temper and color your cocoa butter and paint it on or buy it from a supplier. 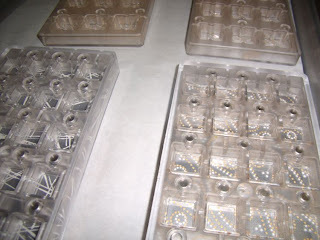 I recommend Kerekes and Chocolat-Chocolat for great transfer sheets and magnetic molds. Josée at Chocolat-Chocolat is very helpful and she speaks English. 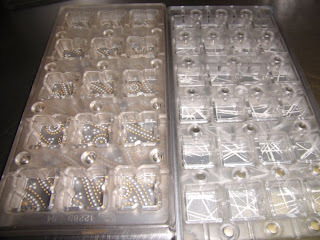 The way a magnetic mold works is, the back is held on with magnets so you can insert a transfer sheet into the mold. Then you fill the mold with chocolate, make a shell, or do whatever you want. And when the chocolate is set, you have the decoration off the transfer sheet transferred onto your chocolate. Just like the rub on tattoos you used as a kid. For instance, the chili chocolates I made the other day, used a transfer sheet. Sure, this takes some equipment. But no one said it would be easy. Enjoy yourself. That's why the world has chocolatiers such as moi, Mark by Chocolate. And remember, the truffle, or the chocolate, or even the cake or plated dessert does not have to be a work of art. It's great if it is. The more you practice, the better they will become. But it has to taste good. And what I mean by that, is that you have to think it tastes good. Not everyone likes everything but there are certain taste combinations that are classic. Try those first and then experiment. Read Andrew Shotts' book Making Artisan Chocolates for some great ideas. It's a great place to start. Also, buy Elaine Gonzalez' book, Chocolate Artistry. She's an artist all right and a wonderful person.